I am home for a couple of days so hope to catch up on all my travels. Early in April I headed to sunny California to teach at Quilters Paradise in Clovis. 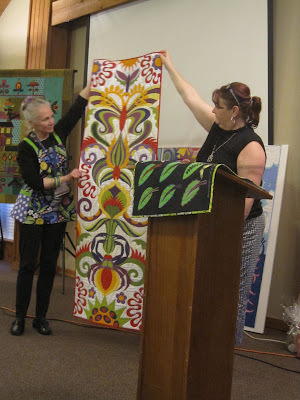 I taught two classes, a one day class embellishing my Sew Your Seeds NeedleKeeper and a two day class appliquéing and embellishing my Pomegranate Table Rug . 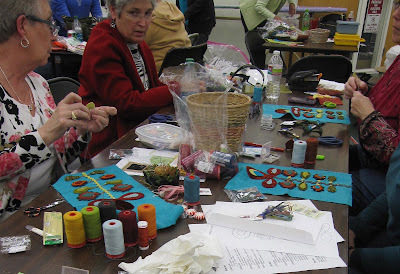 The students enthusiastically worked with ribbon stems attaching them with various couched stitches, velvet leaves and needle turn appliqué. 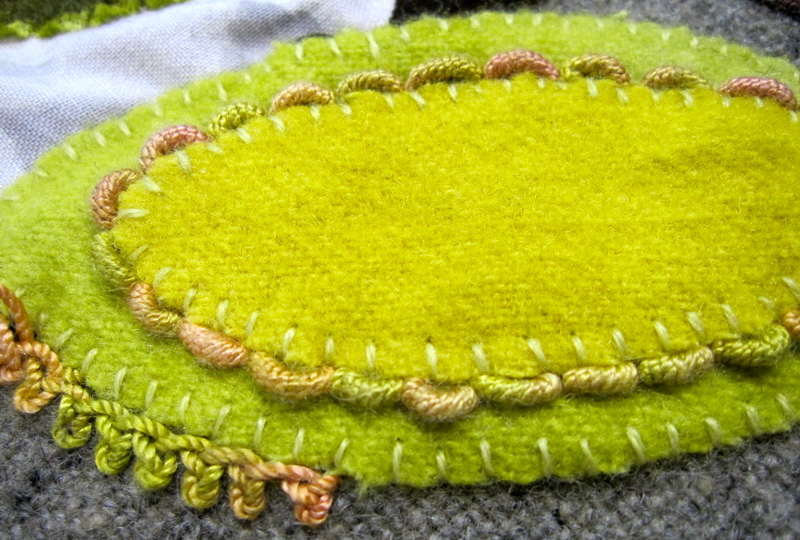 We also used a variety of stitches using different threads and beads to make each piece unique. I only use 5 different needles for handwork and always have a needle case on hand to store each variety on a different page. I also suggest that my students make a little label for each page. This helps to keep them in order until they become familiar with the needles and there uses. 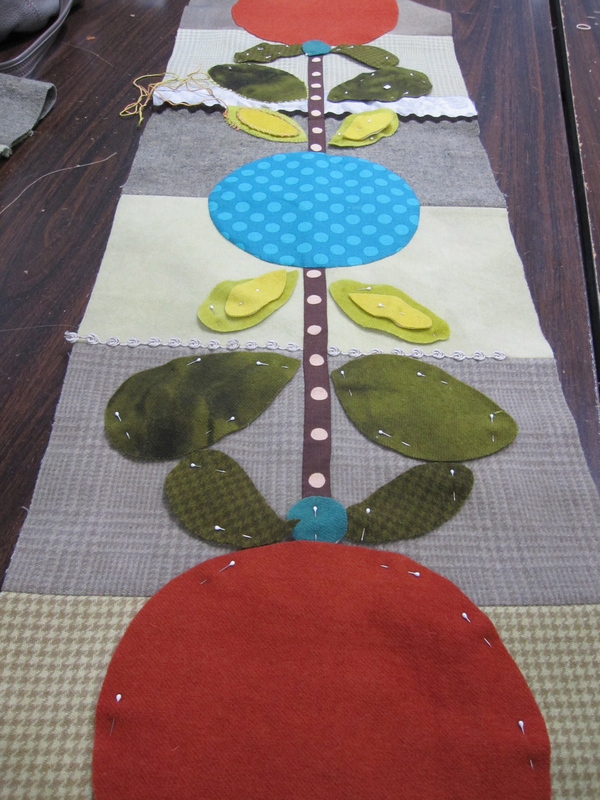 We used a variety of textural fabrics for the background of the Table Rug adding ribbons and cottons for texture. Many students used our ribbons for the stems adding color and variety to each piece. 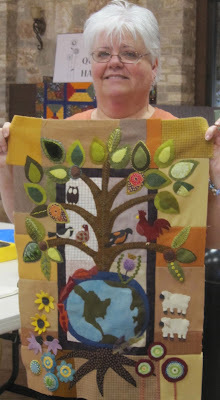 It was fun to have two day class as each student had time to start embellishing with stitches. We used many different threads each adding different textures. Fron here I travelled to Sierra Guild in the Foothills. 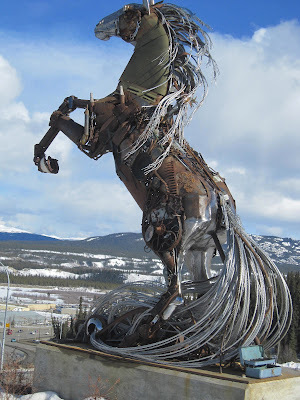 Earlier this month I flew north to Whitehorse in Canada. There was still quiet a lot of snow but the weather was pretty mild. I spent a lovely few days teaching my new sewing roll to a very enthusiastic group of sewers. We worked with hand dyed velvet, wool and cottons and embellished with ribbons and loads of lovely stitches. As this was a three day class most of the students got a really good start to their pieces. The room we created in was very spacious with good lighting and just a short walk to town. Thanks so much Joanne and Kathy for taking such good care of me. 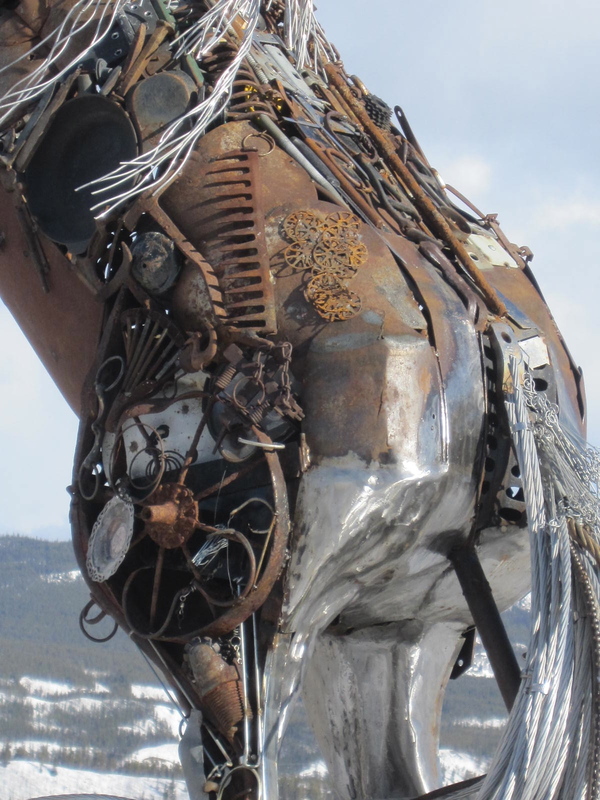 Earlier this month I spent a day teaching and lecturing in Hamilton, Montana. I was surrounded with enthusiastic gals wanting to uniquely embellish leaves. We used Chenille, Silken Perle, Seagrass, Silk thread, Perle Cotton and Dazzle thread in wonderful colors and textures to stitch fun stitches around and onto of our leaves. Rose brought her Crimson Tweed quilt to share with me. 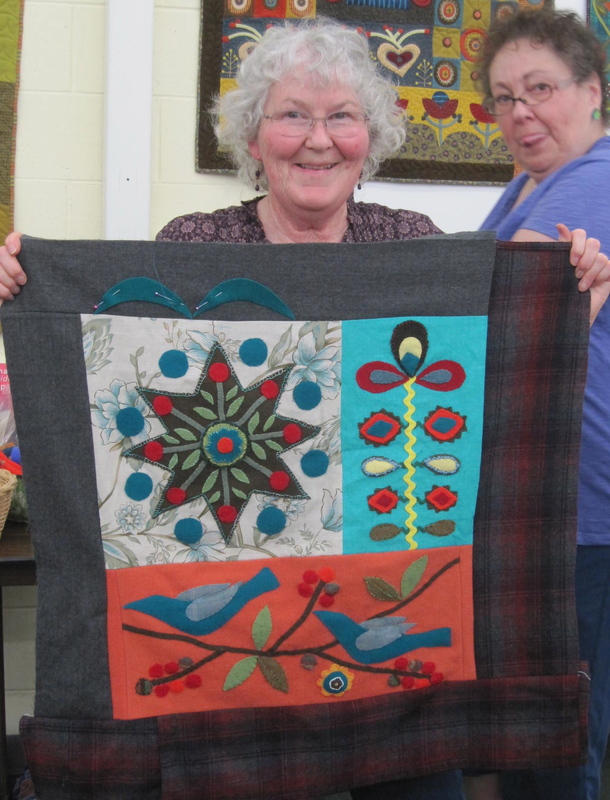 She did a lovely job and now is a proud owner of a finished wool quilt. Many of the gals used unique placement of their leaves. I love this new wool we have. Wendy has found some very interesting textures for us to play with. The Bullion Knots were stitched with one of my favorite varigated colors of Silken Perle thread. Many thanks to all for making me feel so welcome. Keep up the great stitching! Late last month I taught three days at Quilt Crossing in Boise, Idaho. The store is co-owned by Patsy and Laura. Laura introduced me to the class saying she took her first class from me in the late 90’s. 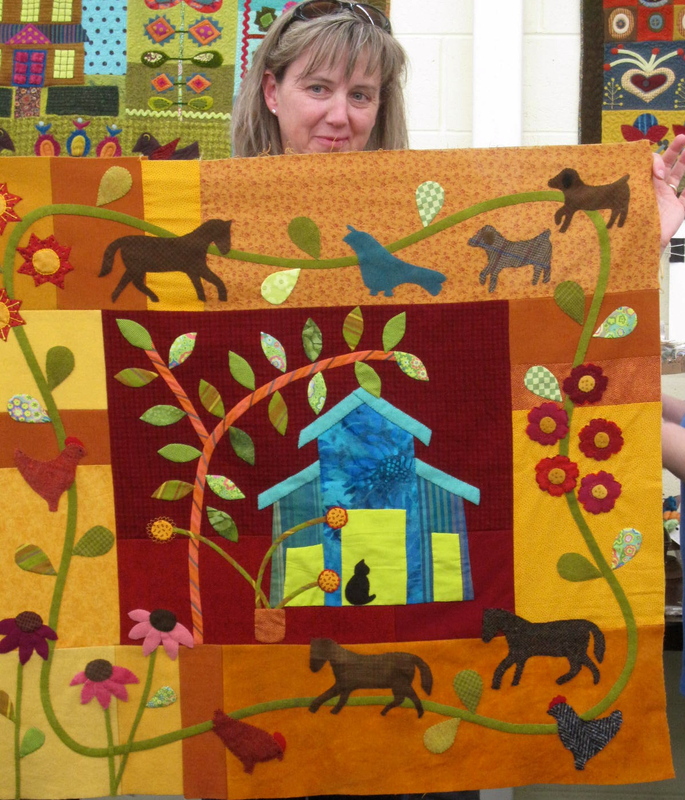 Laura made my ‘Saffron Hill’ Quilt in that class. My style has changed over the years but it was really nice to reminise. It was a very exciting weekend for all at Quilt Crossing as they were in the throws of moving to their new store. I did get a sneak preview of the store and I cannot wait to visit again to see their wonderful new space filled with fabric. 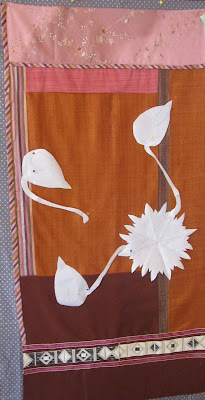 I taught two classes the first the ‘Peony Bloom Pin Keeper’. It is always a fun class as it is colorful and has many fun elements and textures to the assembly. 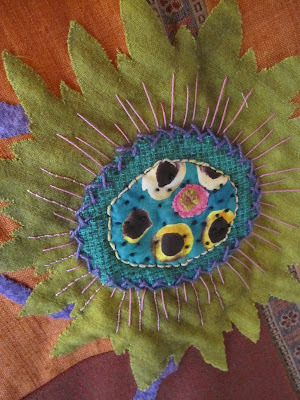 We embellished with some textural stitches and hand made roving balls. It was great to have Cece from the Thread Gatherer in my class. I loved the way she used many of her ribbons to embellish. Sue took Tonye Phillip’s and my class in Sisters, OR last year. She has been working hard on her quilt she designed in that class. 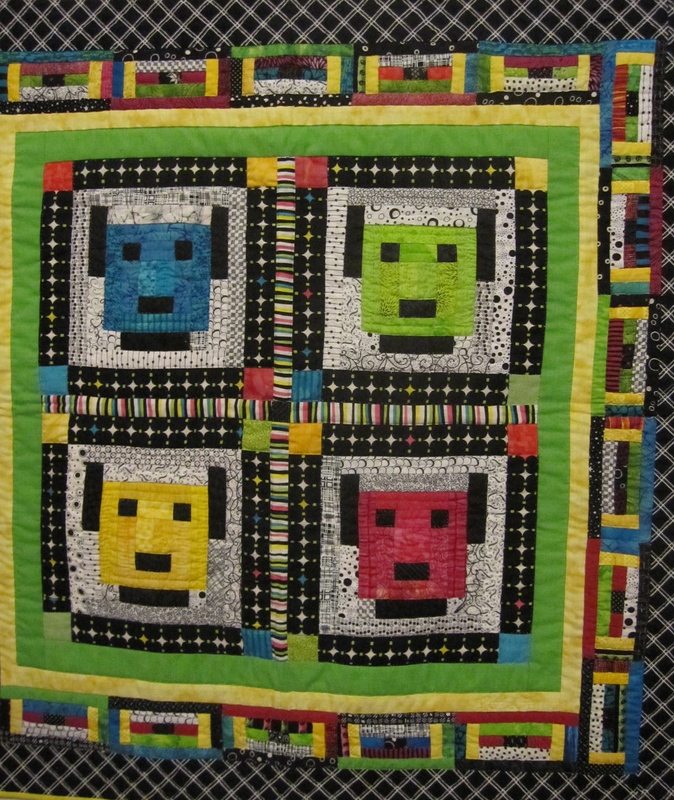 I always love to see the quilts as they progress. 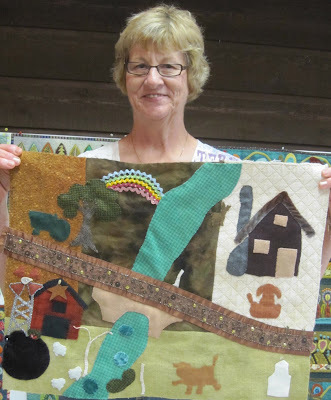 Sue also brought her ‘Robin Run the Hedge’ quilt to share with everyone in class. The second class was my Red Clover Quilt. Many students worked on the appliqué at home so that they could start the embellishment in class. Many samples of my designs were shared in class I loved this fun version of the ‘Sew Your Seeds’ Needle case. 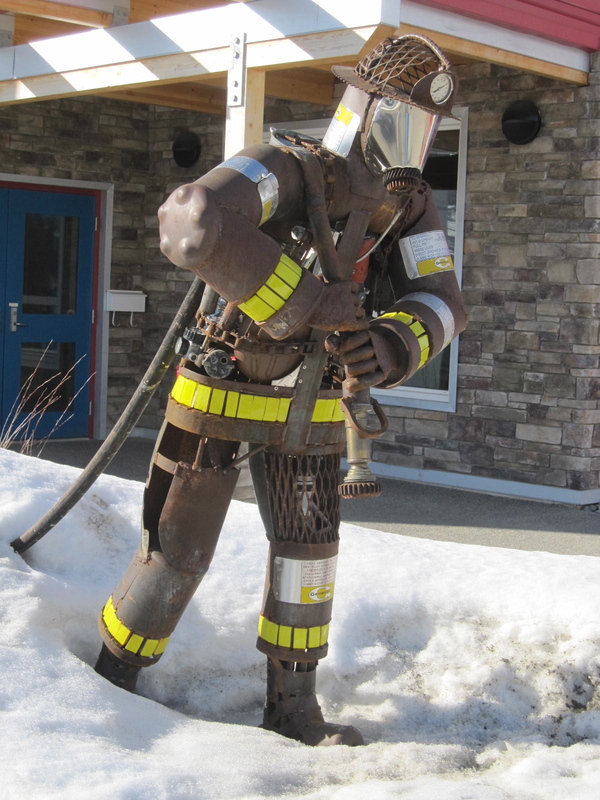 Many thanks Laura and Patsy for a fun visit and Good Luck in your new home. I am looking forward to returning in 2014. Sorry for the long silence. My laptop developed the dreaded black screen and it had to take a visit to the Apple Store. All my photos were on it so I had to wait until I received it back to start blogging again. I have been on the road teaching so will catch up with all the wonderful student work over the next few days. 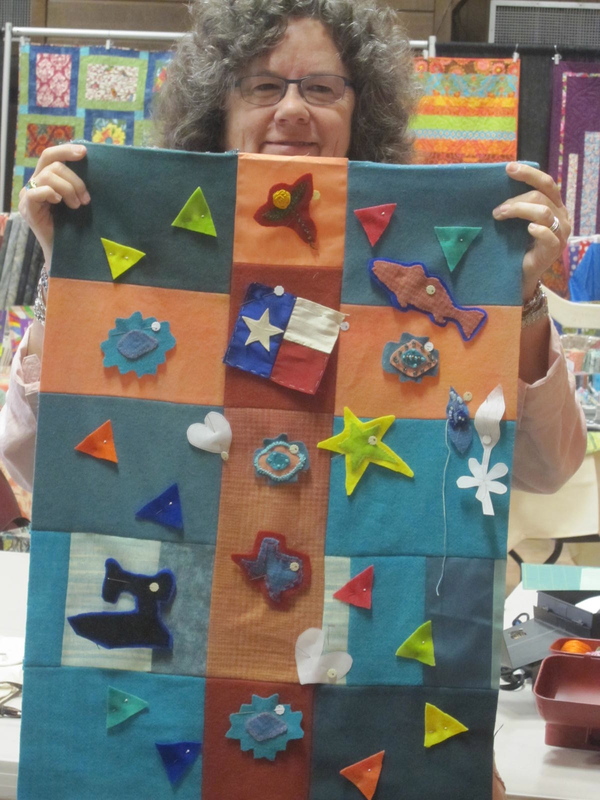 In the middle of March I spent 5 wonderful days teaching in Texas at Quilting Adventures. 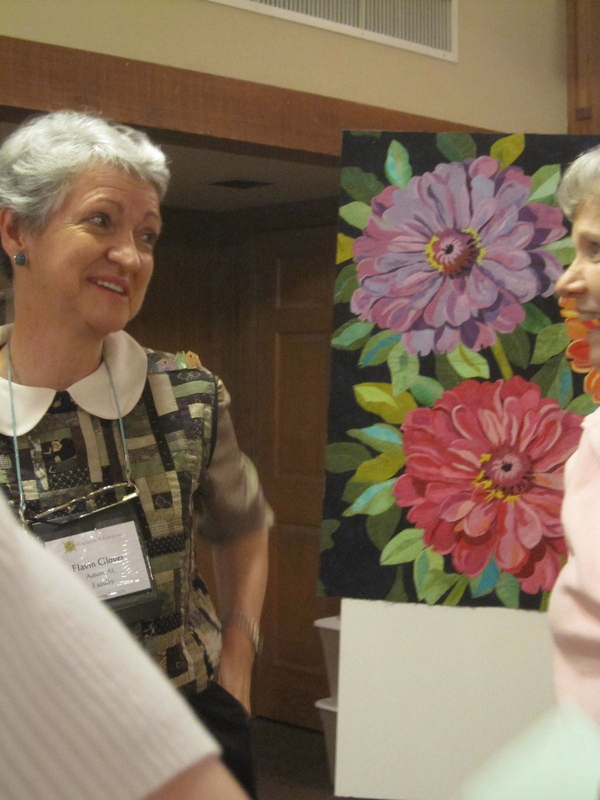 It was fun to get to know and teach with Jane Sassaman, Melinda Bula and Flavin Glover. One evening Jane shared her wonderful quilts. 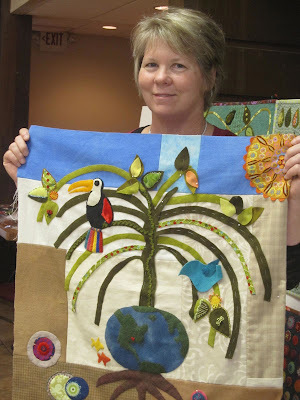 It was so fun to see her version of her leaf sampler. 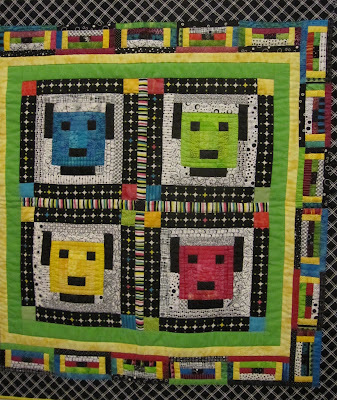 Flavin’s quilts were fun I loved to see the variety of ways she interprets the Log cabin block. What I loved was that for the week each one of us focused on nature but we all taught totally different techniques. I had 12 great students in my class. 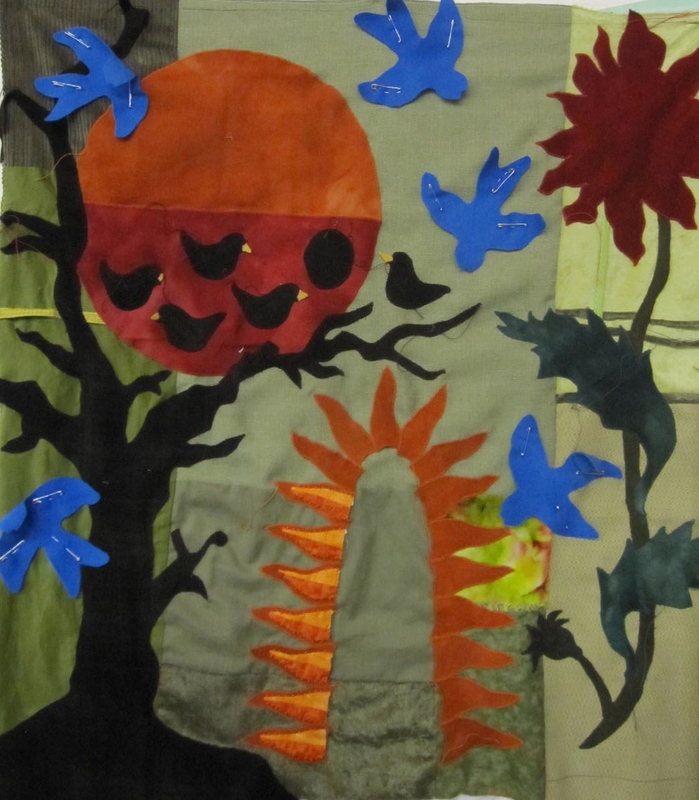 Each designed a different quilt using wool, cottons, velvets and embellishments. Many were about their life and travels and others picked a theme that appealed to them. Mary designed a quilt using my tree idea adding all the places she had lived and adding imagery that had a personal meaning from those special places. Jean loves chickens and decided to use embellished feathers to make him dimentional. 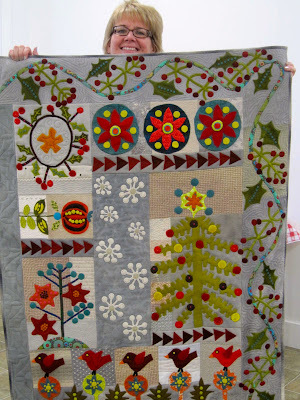 Patti loved doing all the embellishment stitches on the leaves of her tree. Rita has taken many classes from me and this time she started this new quilt. 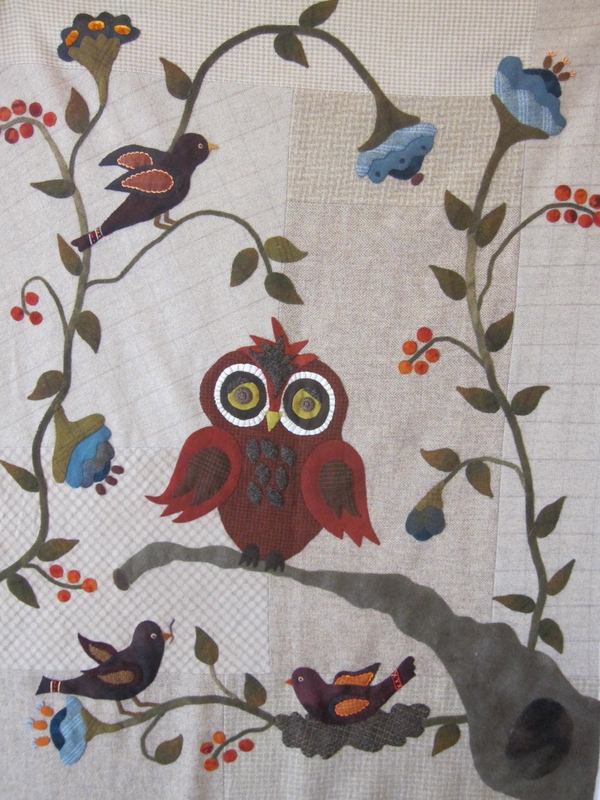 She also brought her owl quilt to show me the progress she was making. 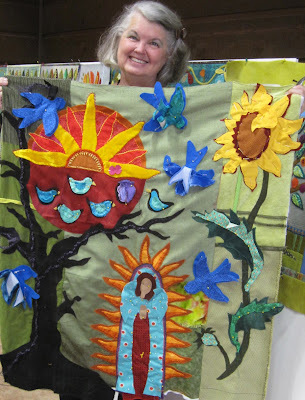 Rita designed this quilt in a class she took from me last year at Asilomar. Lisa has also lived in many places and wanted to incorporated her travels in her quilt. I love her Toucan she was starting to embellish. 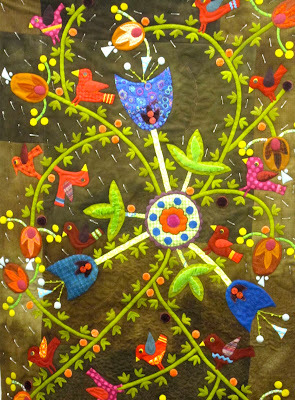 Fay was very new to wool appliqué. 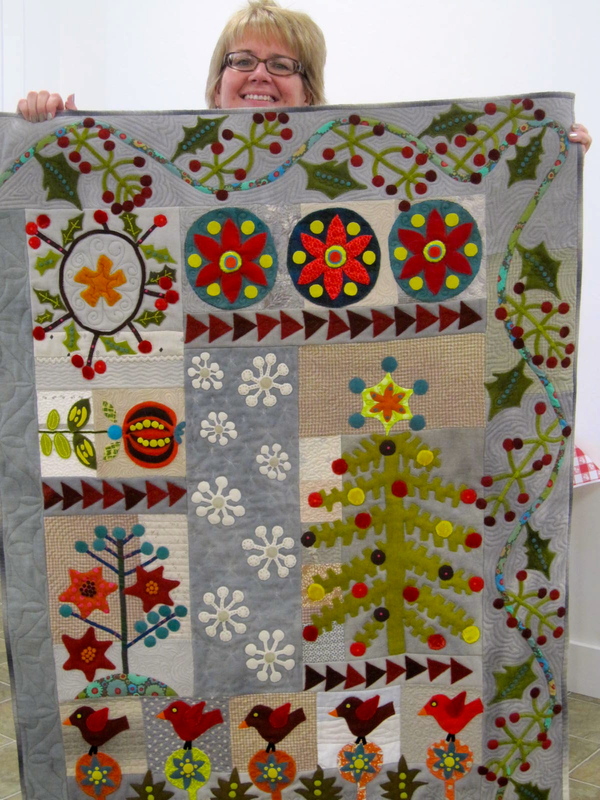 She really took to the embellishment adding dimension to all the images on her ‘Favorite Things’ quilt. 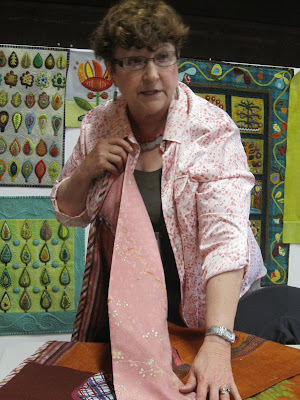 Evelyne lives in Calgary and had taken a class from me when I was at ‘Out of Hand’ last year. She spends her winters in Arizona so come over to join us in Texas. 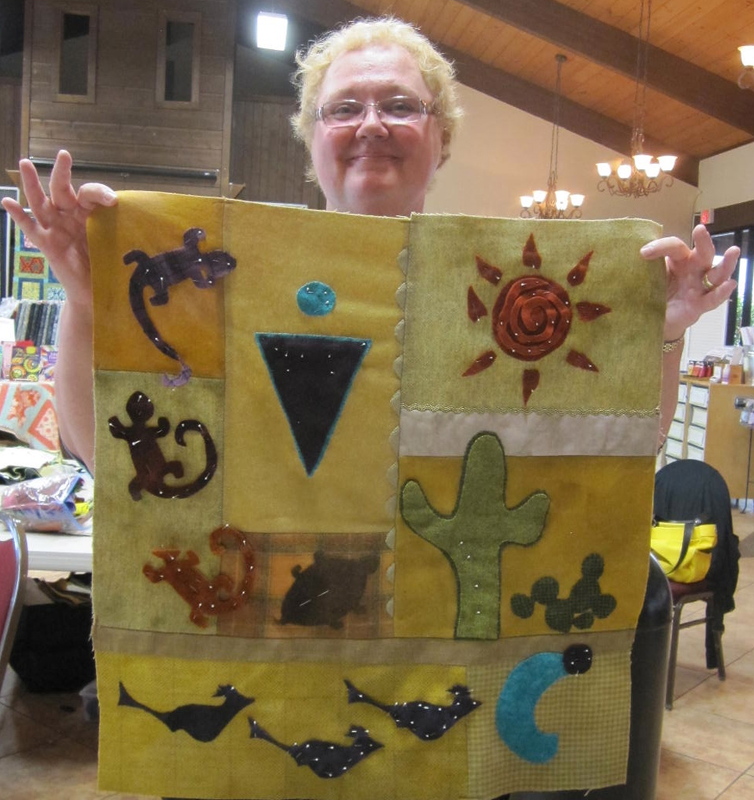 She wanted to make a quilt of all the images she loves in the Southwest. I think she will have a great time embellish this one. Sarah Scott brought all sorts of wonderful fabrics with sentimental value. 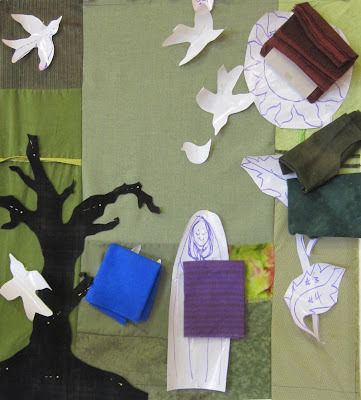 Her goal was to incorporate them into her quilt and then add images related to her family. She seemed to be really enjoying the hand embellishment. 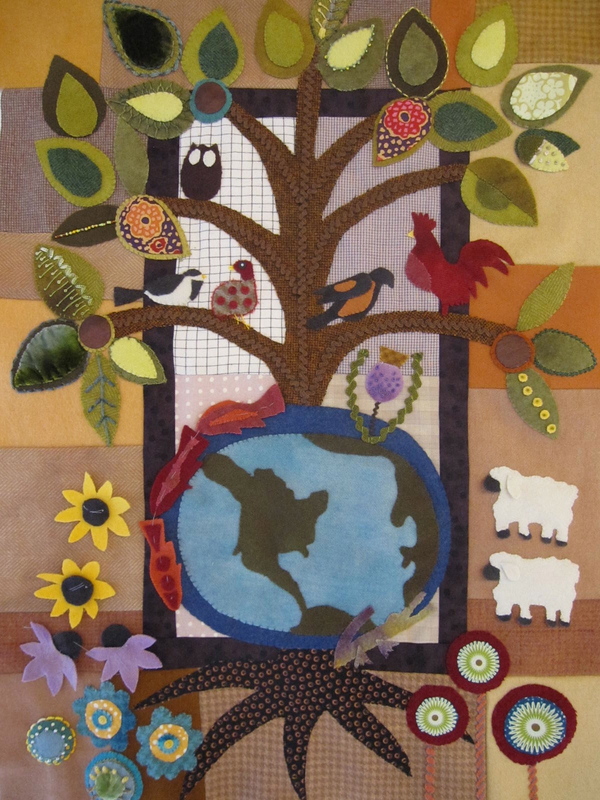 Connie wanted to create a piece about her family farm. It was fun to see this develop. 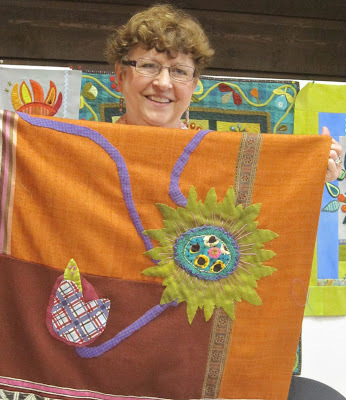 She used many ribbons and lots of hand dyed velvet. Patsy started this piece with me in a previous class. She was ready for more stitches and layering. 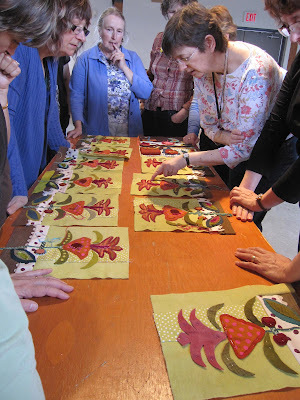 It is very fun to see how many students return to my classes to add new techniques and stitches to their pieces. I love to see these evolve. 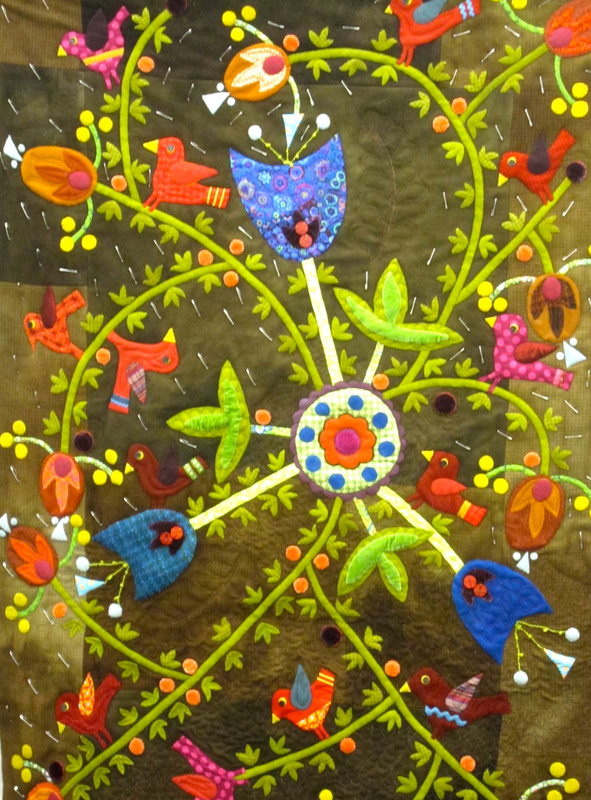 My hope is that one day I can teach a 5 day embellishment class were everyone brings an appliquéd piece and we can then spend all the time embellishing with wonderful stitches and fibers. As more and more people return to do my classes I am thinking this maybe feasible in the near future. Suzanne took on a larger project. Drawing her design then applying it to the background using her sewing machine. She decided to do it this way so she could enjoy doing some hand embellishment. Alice is a master at machine embellishment and wanted to learn a little more hand work. I can’t wait to see how this little piece evolves. She was adding velvet berries and stitches which really popped on her black background. Alice started the piece below in a previous class and brought the finished piece to share with me. 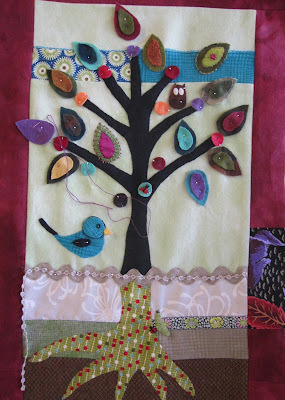 I love her soft colors and use of stitches and rick rack on the branches. It was a treat to spend 5 days with all these gals. Their creativity and enthusiasm was infectious. Many thanks to Deb and Kim for arranging such a special week.